Green leafy vegetables are rich source of iron, calcium, beta- carotene, vitamin C, folic acid and riboflavin. It is no wonder they occupy a special place among vegetables. 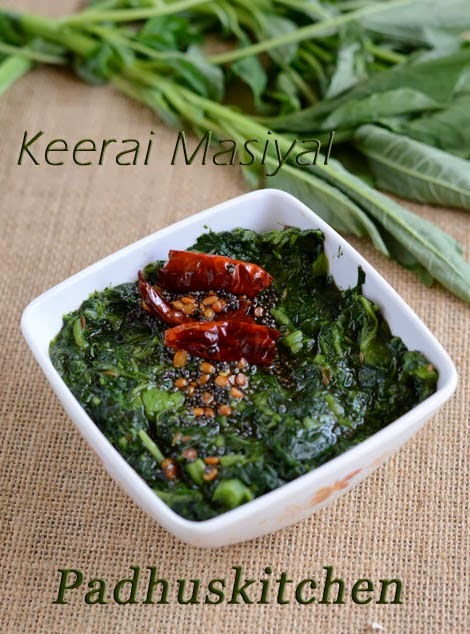 Here is a very simple and easy masiyal recipe prepared with mulai keerai. Wash keerai 2-3 times and chop it finely. Cook uncovered with a little water, adding a tsp of jeera to it. Cooking uncovered helps to retain the green color. Stain the water from the keerai, mash it well and add salt as required. Heat a tsp of oil, add mustard seeds, when it splutters, add urad dal, red chillies and hing. When dal turns golden brown, pour the seasoning over the keerai. This keerai masiyal goes well with hot steamed rice topped with a tsp of ghee and also as a side dish for sambar and rasam rice. Note - If the water stained for the keerai is less, you can add it back to the keerai. If the water stained from the keerai/greens is more, you can use it when making sambar or any other dish. Cooking greens in pressure cooker - You can also use the pressure cooker to cook keerai. Just pressure cook the chopped keerai for 1 whistle. After 5 minutes, release the pressure gently and slowly and then remove the weight. Then mash it well. Follow the same method above (caution - take care when releasing the pressure).